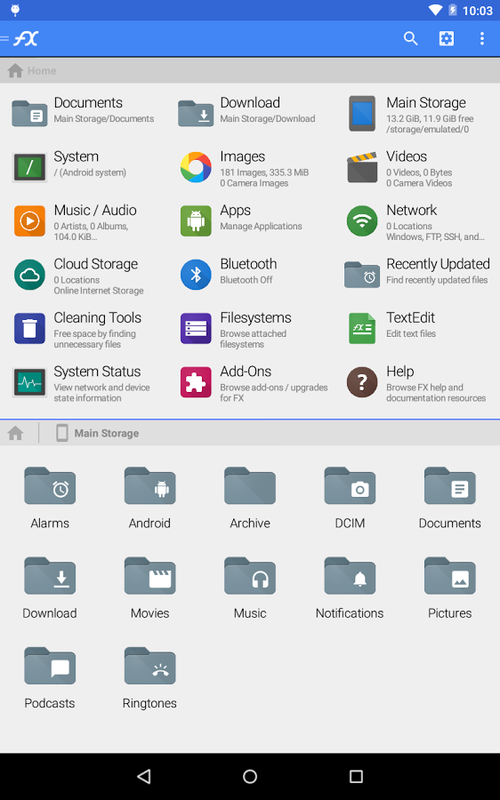 FX File Explorer is a file manager / media manager with networking and cloud capabilities. FX is designed to let you quickly and easily manage all content on your phone or tablet. Google Drive and Google Docs support are now available (in the full version, but it’s free to use during the beta). Google Drive is available under the “Cloud Storage” section. During beta, all features of FX File Explorer are free, including network, cloud, and root access. After the beta period ends, this version will become the “Lite” version. After the beta, FX will retain all local file management capabilities, including search, archival, the text editor, and file viewers. The network, cloud, and media features will be available as an add-on. The root features will be available as an add-on. The FX add-on modules will not be particularly expensive. You can also turn off paid features immediately in the settings if desired. No version of FX File Explorer will have ads. ROOT ACCESS: Please download the FX root module from http://goo.gl/kExIH if you are interested in testing it. The FX root module is free-to-use until the beta period ends. * Download and convert Google Drive / Google Docs files into Microsoft Word, Excel, PowerPoint, OpenDocument, PDF, and other formats. * OBEX Push client and server can use WiFi for high-speed transfers when both are connected to same network. * Streaming video playback: Video format support is dependent upon which third-party playback software is installed on your device. Android typically natively supports MP4 and 3GP. FX can play AVI, FLV, MKV, and WMV formats *IF* you install appropriate third-party players available from other vendors on the Google Play Store. * Bug reports: We greatly appreciate bug reports, feature requests, suggestions, and questions. Please send all requests regarding FX File Explorer to android@nextapp.com.